The Russian president's press secretary, Dmitry Peskov, has said the Russian Aerospace Forces will continue bombing terrorist positions, in accordance with the U.S.-Russian initiative, even after the truce is announced in Syria. "We know that this observatory [the Syrian observatory for human rights] repeatedly provided information which was not backed up by any - I am not saying credible, I am saying at least some data," Peskov told reporters when asked to comment on the reports that the Russian Aerospace Forces are continuing to bomb areas east of Damascus a day before the announcement of the truce. 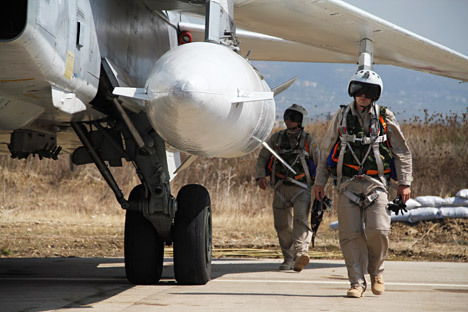 "The Russian Aerospace Forces are certainly continuing the operation in Syria. The operation is carried out in support of this country's armed forces and aimed against the terrorist organizations - Islamic State, Jabhat al-Nusra (both banned in Russia) and others listed by the UN Security Council," Peskov said. "What is also known is that even after the truce comes into effect, the offensive operations against the terrorist organizations will not stop, this is one of the terms of the initiative agreed on by the Russian and U.S. presidents," Peskov said.